There are times when you might want to see what celebrity's birthday shares the current date. Below is such a list. 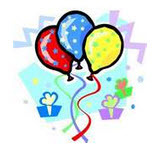 Each name can be further clicked on to see more detailed information from Lois Rodden's website of celebrity birthdays. It comes in quite handy for doing research in the cards and/or astrology and looking for common links, aspects and various factors that tie them all together. To find the current card of the day, check out Sharon Jeffer's website at the Cards of the Magi to see the card and a small reading for the current day. If you would like to look up your own card and get a free mini reading, click on Robert Lee Camp's website.